Liczba stron: 65 Jest to ujednolicona liczba stron, która ułatwi Ci porównanie długości książek. Każda strona Legimi to 200 słów. An amazing weird mystery story, packed with thrills, danger and startling events. Paul Ennis had listened thus far, his haggard face uncomprehending in expression, but now he interrupted the speaker. “Did you ever hear anyone speak words like that?” asked Inspector Pierce Campbell, leaning tautly forward for the answer. He had risen to his feet, a tall, blond young American whose good-looking face was drawn and worn by inward agony, whose crisp yellow hair was brushed back from his forehead in disorder, and whose blue eyes were haunted with an anguished dread. He kicked back his chair and strode across the gloomy little office, whose single window looked out on the thickening, foggy twilight of London. He bent across the dingy desk, gripping its edges with his hands as he spoke tensely to the man sitting behind it. “Why are we wasting time talking here?” Ennis cried. “Sitting here talking, when anything may be happening to Ruth! Inspector Campbell seemed unmoved by Ennis’ passion. A bulky, almost bald man, he looked up with his colorless, sagging face, in which his eyes gleamed like two crumbs of bright brown glass. “You’re not helping me much by giving way to your emotions, Mr. Ennis,” he said in his flat voice. He stopped. “Or it might what?” pressed Ennis, his pale face thrust forward. “It might mean, literally, that the Door leads outside our world and universe,” finished the inspector. 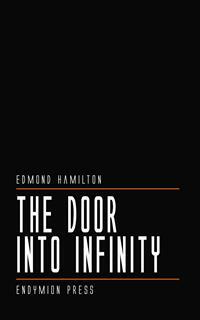 “A door into the infinite outside,” repeated Ennis broodingly, looking past the inspector. Then he made a sudden movement of wild impatience, the dread leaping back strong in his eyes again. “Where is the place?” asked Ennis tensely. “Then if the Brotherhood took Ruth, she may be at that place now!” cried the young American, electrified.